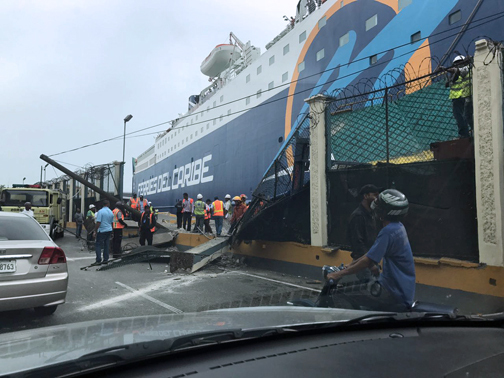 Just two weeks after resuming maritime passenger service between Puerto Rico and the Dominican Republic, Ferries del Caribe had an accident Thursday when the ropes anchoring the vessel broke and allowed the boat to slip about 50 feet. The ship, baptized as “Kydon,” dragged a ramp and impacted several cargo containers waiting at the dock to be transported to Puerto Rico, company officials confirmed. International structural experts will arrive this week to Santo Domingo to repair the ramp, which should allow Ferries del Caribe to resume operations within two weeks, once port authorities and the U.S. Coast Guard inspect and certify that the vessel and the dock facilities are safe to use, executives said. The accident happened Thursday morning, and as part of the initial inspection, graphic material and a preliminary survey conducted by engineers on board were sent to the naval structural experts the boat owners hired. There were no injuries reported. The new vessel — which was completely renovated in 2015 and is of Japanese construction — made its maiden voyage between Puerto Rico and the Dominican Republic on May 3. The service was re-launched more than a year after a fire consumed the “Caribbean Fantasy,” the ship formerly used to provide transportation between the neighboring islands. Now will we start to see how bureaucratic-constipation can convert a minor human error into a long-term delay to see who is willing to sign-off to resume operations and be charged with failing to consider all pages of rules, regulations and renewal of permits before such a huge risk can be taken to let the ship sail again! Or can ‘common sense’ get a chance to live again? Hey Buddy!, I found this information for you: "Ferries del Caribe in accident in Santo Domingo". Here is the website link: https://newsismybusiness.com/involved-accident-domingo/. Thank you.